ESTE PRODUCTO REQUIERE EL JUEGO BASE Heroes of Might and Magic V.
Take part into a thrilling new adventure in the world of Ashan with the Hammers of Fate expansion. Discover uncharted territories and experience new ways of playing Heroes of Might & Magic V.
Queen Isabel's war is over and the Griffin Empire is on its knees. The Empire is paralyzed by a vicious civil war, having barely recovered from the massive conflict against the demon hordes and the undead legions. 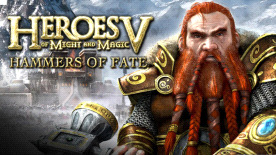 Extended game experience: With new spells and abilities, 5 new single-player maps, 10 new multiplayer maps, new buildings, new artefacts, and new neutral creatures, Heroes of Might and Magic V: Hammers of Fate gives you the tools to develop new tactics and further your game experience both online and offline. Improved mechanics and gameplay: Thanks to new features such as Caravans and a random map generator, you will enjoy an even smoother experience and unlimited replayability. In addition, the simultaneous turn feature will speed up your online games.